The UCard photo upload application is only available to freshmen and transfer students who are receiving their first UCards and are enrolled in a New Student Orientation (NSO) session. This includes students participating in the online NSO sessions. For more detailed information about the photo upload process, please see https://www.umass.edu/ucard/content/ucard-photo-upload. Before you submit your photo please take the time to review the UCard photo requirements at https://www.umass.edu/ucard/content/ucard-photo-requirements. 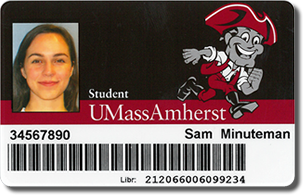 This photo is for your official UMass identification card (UCard), so the photo you submit MUST meet these requirements. Please submit your photo as early as possible. This will allow you enough time to submit another photo if your first photo is rejected. Please note that if you receive three rejections, you will not be allowed to submit a photo a fourth time. You will need to come to the UCard Office to have your photo taken. Monday-Tuesday orientation session must submit their photo no later than the previous Thursday. Thursday-Friday orientation session must submit their photos no later than the previous Tuesday. Online orientation participants must submit their photos no later than August 20th. Winter orientation participants must submit their photos no later than January 10th. After you submit your photo, check your email. You should immediately receive an email notifying you that your photo was successfully uploaded. Within 1-2 business days, you should receive a second email letting you know that your photo was approved or rejected. In the case of the latter, the email message will include the reason(s) why your photo was rejected.